· Sociology is sometimes called the child of the ‘age of revolution’. · Experienced in Europe during the late 17th and 18th centuries. · Also known as the ‘age of reason’. · Rational thought as the central features of the human being. · Only persons who could think and reason could be considered as fully human. · The Enlightenment was made possible by, and in turn helped to develop, scientific, secular and humanistic, attitudes of mind and a new understanding of the world. · Science and reason came to be considered more important than religion and tradition. · It is announced the arrival of political sovereignty at the level of individuals as well as nation-states. · The Declaration of Human Rights asserted the equality of all citizens. · It brought about the freedom of the individual from the oppressive rule of the religious and feudal institutions that dominated France before the Revolution. · The ideas of the French revolution – Liberty, Equality and Fraternity became the watchwords of the modern state. · It began in Britain in late 18th C.
o Systematic application of scientific principles to industry. o New organization of labour and market on a large scale. · Spinning Jenny, steam engine are facilitated the production process gave rise to the factory system and mass manufacture of goods. · The factories set up in urban areas were manned by workers who were uprooted from the rural areas and came to the cities in search of work. · Low wages at the factory meant that men, women and even children had to work long hours in hazardous circumstances to eke out a living. · Modern industry enabled the urban to dominate over the rural. · The rich and powerful lived in the cities, but so did the working classes who lived in slums amidst poverty and squalor. · Modern forms of governance, with the state assuming control of health, sanitation, crime control and general ‘development’ created the demand for new kinds of knowledge. · Marx argued that human society had progressed through different stages. These were: primitive communism, slavery, feudalism and capitalism. Capitalism was the latest phase of human advancement, but Marx believed that it would give way to socialism. · Capitalist society was marked by an ever intensifying process of alienation operating at several levels. o Workers do not own the products they produce. o Workers have no control over the work process itself. · Human beings are alienated from each other. o Human beings are both more free but also more alienated and less in control of their lives than before. · Marx believed that capitalism was nevertheless a necessary and progressive stage of human history because it created the preconditions for an egalitarian future free from both exploitation and poverty. · Marx’s idea of economy was based on the concept of a mode of production. · Primitive communism, slavery, feudalism and capitalism were all modes of production. · Marx placed great emphasis on economic structures and processes because he believed that they formed the foundations of every social system throughout human history. · Marx argued that we can change society in future through class struggle. · The most important method of classifying people into social groups was with reference to the production process. · He argued that people who occupy the same position in the social production process will eventually form a class. · Classes are formed through historical processes. · He believed that class struggle was the major driving force of change in society. · As society evolved from the primitive to the modern through distinct phases, each characterized by particular kinds of conflict between the oppressor and oppressed classes. Marx and Engels wrote, ‘Freeman and slave, patrician and plebeian, lord and serf, guild master and journeyman, in a word, oppressor and oppressed, stood in constant opposition to one another, carried out an uninterrupted, now hidden, now open fight’. · Such ‘class consciousness’ leads to class conflicts which can lead to the overthrow of a dominant or ruling class by the previously subordinated class –called a revolution. · He was the first to become a Professor of Sociology in Paris in 1913. · According to Durkheim: social solidarities exerted pressure on individuals to conform to the norms and expectations of the group. Durkheim’s vision of sociology as a new scientific discipline characterized by two defining features. · Firstly, the subject matter of sociology (the study of social facts) — was different from the other sciences. · Sociology concerned itself exclusively with the level of complex collective life, were social phenomena emerge. o for example, social institutions like religion or the family, or social values like friendship or patriotism etc. · Secondly, like the natural science, sociology was an empirical discipline. · Sociology, a discipline that dealt with abstract entities like social facts, could nevertheless be a science founded on observable, empirically verifiable evidence. o The most famous example of his use of a new kind of empirical data is in his study of Suicide. · social facts could be observed via social behaviour, and specially aggregated patterns of social behaviour. · Social facts are collective representations which emerge from the association of people. o They are not particular to a person but of a general nature, independent of the individual. o Attributes like beliefs, feelings or collective practices are examples. Division of labour us the specialization of work tasks, by means of which different occupations are combined within a production system. · He argued that while a primitive society was organized according to ‘mechanical’ solidarity, modern society was based on ‘organic’ solidarity. · Low division of labour. · Each person within a particular group is engaged in similar activities or functions. · People in this society are bound together by common experience and shared beliefs. · Such societies are not very tolerant of differences and any violation of the norms of the community attracts harsh punishment. · Individual and the community were so tightly integrated that it was feared that any violation of codes of conduct could result in the disintegration of the community. · It is based on the heterogeneity of its members. · Where most social relationships necessarily have to be impersonal. · Each of its constituent groups or units is not self-sufficient but dependent on other units/groups for their survival. · Interdependence is the essence of organic solidarity. · It celebrates individuals and allows for their need to be different from each other, and recognizes their multiple roles and organic ties. · In modern societies, the law aims to repair or correct the wrong that is done by a criminal act. · In modern society the individual was given some autonomy, whereas in primitive societies the individual was totally submerged in the collectivity. · Max Weber developed and used methodological and theoretical approaches to study social problems. 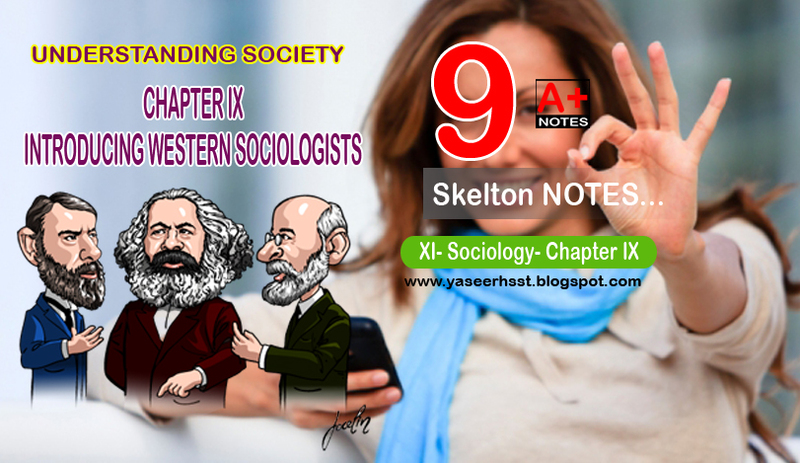 · He believed that social action is the main subject matter of sociology. · Social action involves: Action, Situation, Means, and Ends. · Sociology was thus a systematic form of ‘empathetic understanding’, that is, an understanding based not on ‘feeling for’ (sympathy) but ‘feeling with’ (empathy). · Weber was discussing the special and complex kind of ‘objectivity’ that the social sciences had to cultivate. · The social world was founded on subjective human meanings, values, feelings, prejudices, ideals and so on. · Describe this meaning accurately, social scientists had to constantly practices ‘empathetic understanding’ by putting themselves (imaginatively) in the place of the people whose actions they were studying. · Thus, ‘empathetic understanding’ required the sociologist to faithfully record the subjective meanings and motivations of social actors without allowing his/her own personal beliefs and opinions to influence this process in any way. · In other words, sociologists were meant to describe, not judge, the subjective feelings of others. Weber called this kind of objectivity ‘value neutrality’. · The sociologist must neutrally record subjective values without being affected by her/his own feelings/opinions about these values. · Weber also suggested another methodological tool for doing sociology — the ‘ideal type’. · An ideal type is a logically consistent model of a social phenomenon that highlights its most significant characteristics. · Ideal types may exaggerate some features of phenomenon that are considered to be analytically important, and ignore or downplay others. · Obviously an ideal type should correspond to reality in a broad sense, but its main job is to assist analysis by bringing out important features and connections of the social phenomenon being studied. · The ideal type was used by Weber to analyse the relationship between the ethics of ‘world religions’ and the rationalisation of the social world in different civilisations. · It was in this context that Weber suggested that ethics of certain Protestant sects within Christianity had a deep influence on the development of capitalism in Europe. · Rational legal authority which prevailed in modern times was epitomised in the bureaucracy. · Which was premised on the separation of the public from the domestic world. · This meant that behaviour in the public domain was regulated by explicit rules and regulations. · They also arranges in a hierarchy or power. · Modern large scale enterprises cannot function without bureaucracy.